What happens when you really celebrate your “blackness” in a school? Will you intimidate people? Will there be whispers about what you are doing? 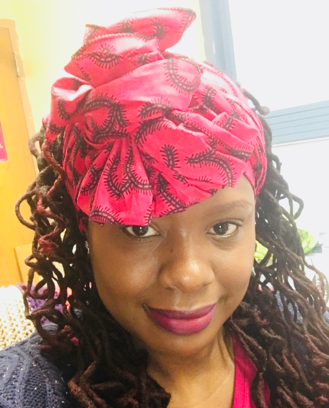 During one of my many conversations with my two friends at work in November, we were talking about wearing head wraps more regularly. As the conversation progressed, all three of us made the decision to wear head wraps every school day during the month of February in honor of Black History Month, which was really only 14 days of school due to Mid Winter Recess. We wanted to challenge ourselves and celebrate Black History in a different way by making a statement. The most common way to honor Black History Month in many schools is by having kids choose a notable Black person for a research report, collage, or poster project. Why not celebrate Black womanhood by showing students our pride and self-confidence? I decided to invite our coworkers to join us by putting up a flyer that was “friendly” to women of all races and ethnic backgrounds, with backing from our principal. Our staff is about 60% Black and Latino and 40% White. Initially, I did not know what to expect, so I just let it rock! There was no pressure to participate. Staff members started asking questions about where they could purchase cloth for their head wraps. They wanted to ensure that someone would actually wrap their heads (which would be me). The response was amazing! On our first day, our Science teacher came into my office and thanked my friend and I for initiating the challenge. Teary eyed, she expressed how proud and great she felt about agreeing to participate in our movement. The most difficult task for me was getting around the building from day to day to make sure I was able to photograph everyone with their head wrap. I had to end up telling everyone to take selfies and send them to me. I started a hash tag (#blackhistoryheadwrapchallenge) where we posted pictures of staff and ourselves. From day to day, my friends and I were delighted by the staff participation (from all ethnicities). Each day we became curious about what to expect. One teacher cut up cloth and created head wraps for all of the 5th grade girls in her class. One of our first grade teachers is from Nigeria and she came in with different kinds of head wraps that stood high atop her head in such a regal way. The beauty and the “magic” she exuded was life! On February 28th, our last day of the head wrap challenge, we all dressed in traditional African clothing. It was breathtaking! Although we are a very family oriented and celebratory school, this day was epic! The representation of women dressed in various prints and head wraps totally moved the school community. As a Black educator, I’ve always wanted to work with “my” people because it’s important for me to be the hope that some of our children lack in their lives. They need to see that people that look like them care about their futures. Instilling a sense of pride, dignity, and self-respect, is just as important as children learning to read. After being an educator for so long, I am looking for things to come full circle in the work that I am doing now for children. I am proud of the impact we made on our school community and will continue to develop programming that helps build our school culture and community. Nona Fontnel is a Special Education Teacher who has been working 14 years for the New York City Department of Education. She is currently a Literacy Coach for grades K-5. She has been developing the school’s ELA curriculum for the last four years. She loves ELA curriculum design and planning and is an avid reader since elementary school. She lives by quotes, loves tea, all things coconut, and things that sparkle!